Soft drinks are no longer an occasional treat; they’ve become a daily habit for a growing number of kids, teens and young adults. But did you know a steady of diet of soft drinks can lead to tooth decay? It’s a problem the Glen Oaks Dental team sees in their offices nearly every day. That’s why the Minnesota Dental Association (MDA) is leading the effort to educate Minnesotans about this important public health problem with its Sip All Day, Get Decay® campaign. Certain bacteria in the mouth take the sugar in soda and produce acid, which attacks the teeth and starts the decay process. Diet or “sugar-free” soda contains its own acid, which also can damage teeth. Each attack lasts about 20 minutes and starts over with every sip of soda you take. You can easily figure out the amount of sugar in drinks by reading the label. Simply divide the grams of sugar per serving by 4 to determine the teaspoons of sugar per serving. Remember, a bottle of soda is often more than one serving! A bottle of soda pop in the 50’s was 6.5 ounces. Today, a 12-ounce can is standard and a 20-ounce bottle is common. Larger container sizes mean more calories, more sugar and more acid in a single serving. A 64-ounce “Big Cup” has more than five cans of soda pop in a single serving! There is no nutritional value in soft drinks. In regular soda pop all of the calories come from sugar. In addition to cavities, heavy soda pop consumption has been linked to diabetes, obesity and osteoporosis. One-fifth of all one- and two-year-old children drink soda pop. Today, teens drink three times more soda pop than 20 years ago, often replacing milk. Soft drink companies pay high schools and middle schools big bucks to offer their products. Sealants only protect tooth chewing surfaces. Soda pop decay tends to occur where sealants can’t reach. Drink soft drinks in moderation. Don’t sip for extended periods of time. Ongoing sipping prolongs sugar and acid attacks on your teeth. Use a straw to keep the sugar away from your teeth. After drinking, swish your mouth out with water to dilute the sugar. Never drink soda pop or juice before bedtime because the liquid pools in your mouth and coats your tongue and teeth with sugar and acid. Read labels. 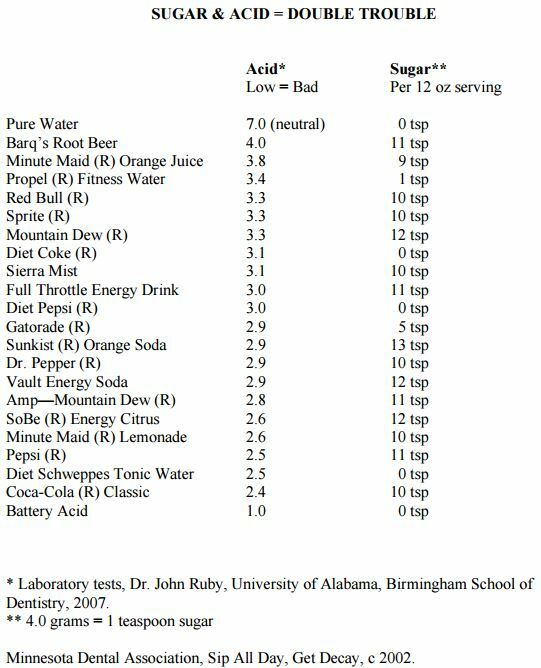 Regular soda pop is high in sugar. 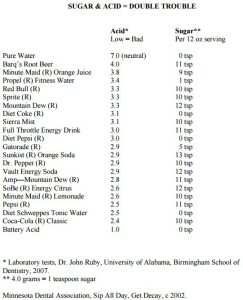 And diet or “sugar-free” soda pop is high in acid. Sugar and acid are both bad for your teeth. Drink water instead of soft drinks. It has no sugar, no acid and no calories. Use a fluoride toothpaste to protect your teeth. Floss, too. This doesn’t mean a person should never drink soda. In fact, drinking it in moderation may cause no harm at all. However, continual and/or excessive drinking of sugary, acidic carbonated beverages could cause decay in the long run. You can avoid tooth decay from drinking too many soft drinks – just limit your intake, brush and floss twice a day, and have visit your dental team at Glen Oaks Dental regularly. Time for a cleaning? Give us a call at 763.786.8460 or schedule an appointment online. We look forward to seeing you and your smile!